Palettes are my makeup must-haves! They offer you choices and color combinations any artist would want! I was recently gifted some amazing loot (which I can't wait to share) and one of the items included this mark On The Dot eye color compact. This 2 x 3 inch compact has 9 gorgeous pastel colors. 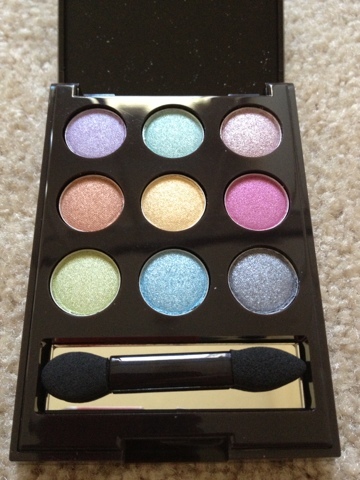 The pigmentation for the colors are great and add a nice pop of color to your everyday neutrals. :) They're a bit shimmer though so adding as a liner or a subtle blend works best for an office-look. Going out? Smoke it with the steel blue/grey on bottom right and pop it with the lime green!